Not content with its current sprawling spread of sports channels, Sky has announced that it will be launching another, dedicated to those who get their kicks out of European football. Sky has revealed that its seventh dedicated sports channel will be called Sky Sports 5 (maths clearly not a strong point) and will screen up to 600 live European football matches next season - including live coverage of Holland's top division Eredivisie, European Qualifiers, UEFA Champions League, La Liga and Copa del Rey. 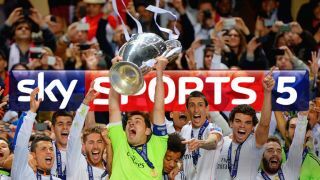 The channel will be available to both Sky and Virgin Media customers - in both SD and HD - and will go some way to remedy the fact it will be losing Champions League football to arch rival BT Sport from 2015. Unlike other channels that just magically appear in your EPG, if you want Sky Sports 5 (which is free to Sports subscribers) then you have to register by pressing the Red button on your Sky remote from 12 June or by going online. But there is a bigger incentive here - customers will be offered two years' free Sky Broadband Unlimited worth £7.50 a month. Now TV vs Sky TV: which is best for you?